We have now signed up to Easy Fundraising to raise more money for the school. The great news is it costs you NOTHING! So far, with only 20 members... £241.18 has been raised for the school. Imagine how much we could raise if 100 parents / grandparents sign up! When you go online to shop, simply click onto the easyfundraising site first, log in and then go through to the retailer you wish to shop with and continue as normal. 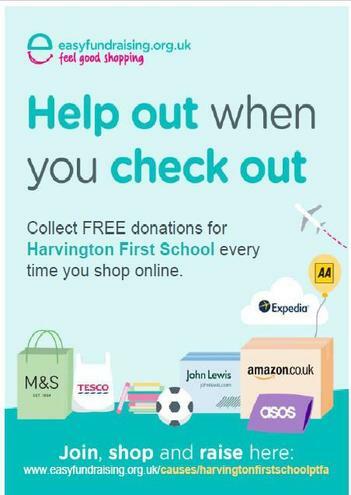 You pay nothing extra but the school receives a donation from the retailer! This is especially worthwhile when you renew your home insurance - SwiftCover just donated £16 to Harvington First School for one member's latest home insurance purchase! Many of the other insurance companies also donate generously.